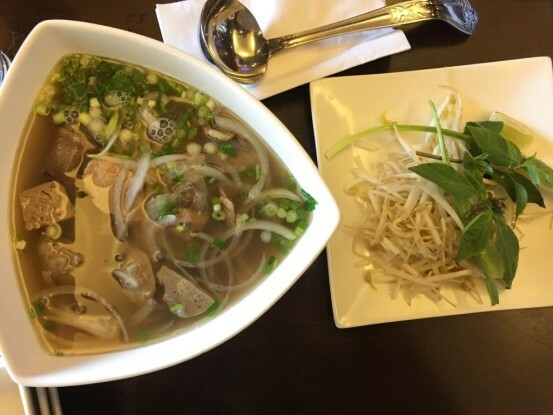 Steve Dolinsky shares the results of his Chicago Pho Crawl, in which he tried and ranked 31 bowls of pho in the city. 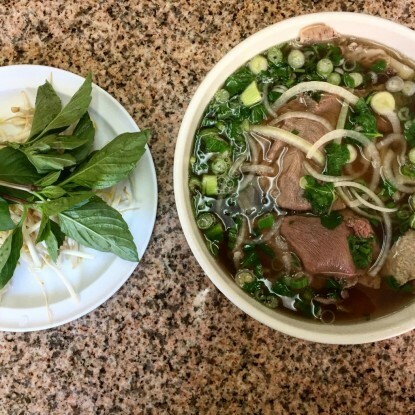 CHICAGO (WLS) -- In Tuesday's post, my Pho Conspirator and I laid out our methodology and procedure for finding the best bowls in Chicago. Now, we start sharing the results. If you haven't already, read Tuesday's story for background; it will explain a lot. 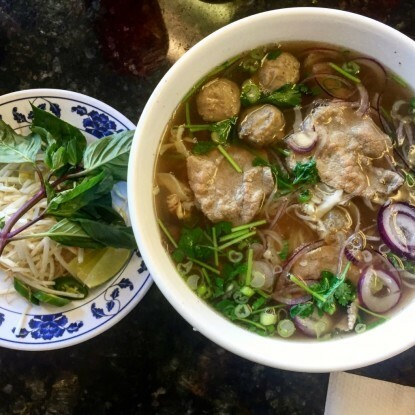 We tried to stick to places where pho plays a big part of the menu, or at least the restaurant attempts to offer it as a meal in and of itself. Again, a few extra points if they include culantro (saw tooth leaf) on the condiment plate and bonus points for aromatic broth (served hot) with tender, thinly-sliced eye of round and slightly fatty brisket. We never added any garnishes to the bowls. That said, on occasion, we would create a "yin yang" dish (my term for the half sriracha-half hoisin sauce combo) in case we wanted to dip any beef into it once pulled from the broth. 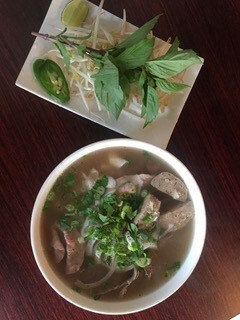 Every order was the same: pho dac biet (house special) which typically comes with the full arsenal - eye of round, brisket, meatball, tripe, tendon, etc. 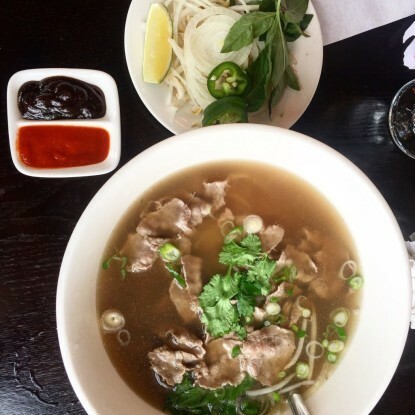 The only pho in Hyde Park, it's owned by Thais, who run a Thai restaurant next door; they also offer a chicken and a vegetarian pho. The yin-yang of hoisin-sriracha is served along with the condiment plate. Broth had very little beefy flavor, and the bowl included shards of lettuce (? ), basil, sprouts and cilantro. Noodles were too soft, not enough bite; only beef in the bowl was eye of round. Our server seemed annoyed, even though we were the only table in the restaurant. 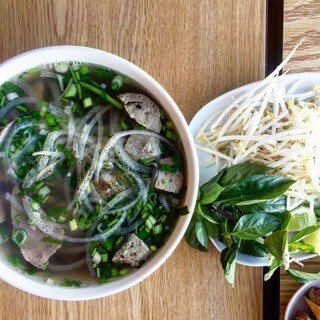 With a TV blaring Vietnamese pop music acts all day, the customers are, with few exceptions, all ex-pats. Large condiment trays with soy, fish sauce, etc. adorn each table. 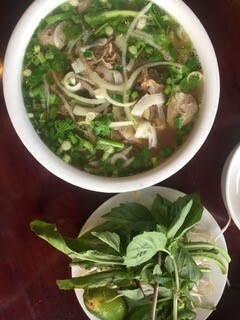 On top of the bowl, sliced red onions, a rarity, with cilantro and scallion; the broth is warm-ish with tough eye of round and brisket in a watery broth. Bowls arrive with lots of cilantro and onion across the top. Oddly dry eye of round and the meatball had a very odd taste that actually forced me to spit it out. Broth was tepid at best. Super-friendly owner, but got the sense he was all by himself. Saw him wait tables then go back and plate dishes and pho in the kitchen. 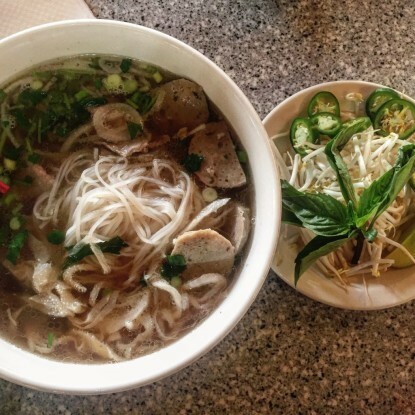 We learned that the chef from LC had left recently to open up LD Pho, just a few blocks away. His absence shows. Broth smelled o.k. but not wonderful; was more spice-forward. Temperature good but not stellar. Topped off with a lot of cilantro and white onion. Real problems lie in the bowl: eye of round was too tough and so were noodles, oddly enough. Meatballs pretty good but broth - even tough nicely strained - lacking beefy flavor (though somewhat aromatic). One of the smallest menus we encountered. With giant oil paintings, wicker chairs and steel-framed mirrors, it was definitely the nicest dining room on the Crawl. Our deep bowl arrived not only with plenty of cilantro, scallion and onion scattered across the top, but also some fried garlic and black pepper. Too bad it was barely warm, and only contained sirloin and a $2 meatball surcharge. The basil had seen better days as well. When it's not steaming, it's hard to discern much aroma. 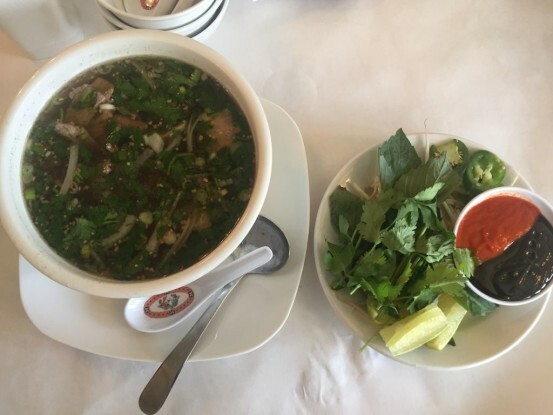 Also known as "Saigon Bistro Crawfish," the restaurant seems to have undergone an identity shift since I named it to my Top 5 Pho a couple of years ago (they still tout this on their website). Not anymore, I'm afraid. They now really push the large, Cajun-influenced menu with crawfish, blue crabs (and apparently karaoke, judging by the huge speaker system and disco light in the corner). Served in an oddly modern but not very functional triangular bowl, it's aromatic but light on the beef. While we liked the eye of round just fine, with a decent aromatic broth, the soup was barely warm and not nearly as beefy as it should have been. While most of the meats tasted fine - a little toothsome here, a little tender there - the brisket was remarkably tender, despite appearing to have been sliced with the grain. Springy meatballs (embedded with tiny shards of tendon) made for good, beefy chewing. 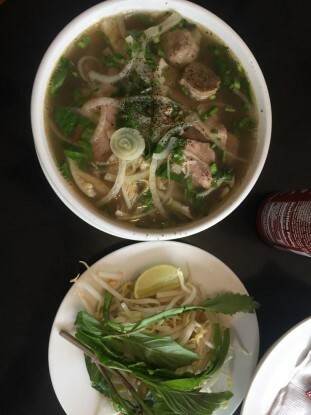 The broth was pleasant but certainly not remarkable, and like too many other bowls, simply not hot; it came doused in a shower of black pepper as well. This Argyle Street stalwart (another one of my previous Top 5s from two years ago) has slipped a bit. The bowl came out with a strong, beefy smell, but lacked almost any discernable aromatics. In fact, it was far too dark, to the point of being off-putting and wasn't nearly hot enough. Despite having a lot of meaty cuts buried within the bowl, too many of them were sliced too thick. The meatballs were particularly off-putting, tasting more like fish than beef. It didn't help that our server was grumpy, unprofessional and clearly annoyed we were sharing a bowl, but not sure I need to go back anymore. The space is dated, dingy and relies on a big menu with a lot of traditional dishes. The broth was strong on aromatics but missing the beefy smell. It certainly looked appealing, but most of the beef was sliced way too thick, resulting in overt chewiness, making the eating too difficult. Like so many other places, the broth was simply not hot. 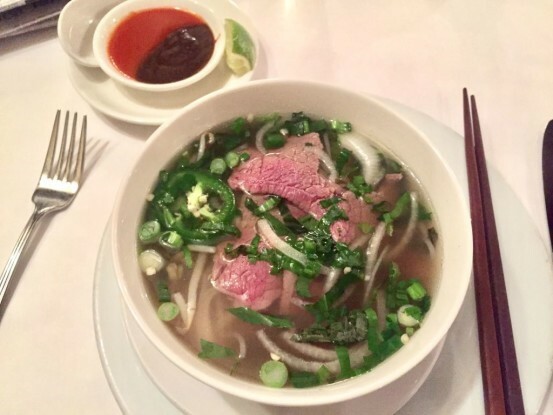 We felt it had an off-taste, almost venturing into a category we called "tangy," which is not something you want in your pho. 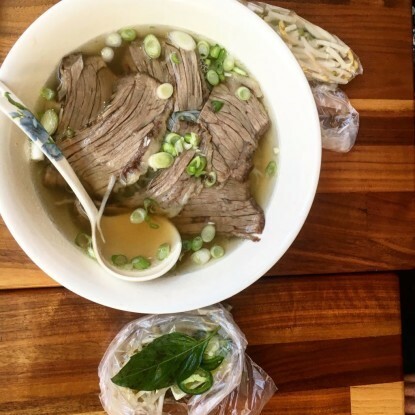 We did, however, fall hard for their bun bo hue - a spicy soup with different noodles and garnishes - and it made me think we need to do a #ChicagoBunBoHueCrawl next time around. Jammed with meatball, tripe, brisket and eye of round, the bowl looked promising, topped with a smattering of scallion, white onion and black pepper. I remembered this place came in as an honorable mention when I picked my Top 5 two years ago, and recalled the chef/owner used to work at Pasteur. As we hovered over the bowl, we noticed two things: a beefy aroma with good aromatics (certainly clove) and some steam (not enough, mind you, but at least it was steaming). Things were looking up, until we tasted the beef. All of them were sadly overcooked to the point of being grainy and chewy. Meatballs fared better, but we suspected this was because they were all made the day before (we were the first guests in the door the day we visited, and the space was chilly and dark). Tank is perennially one of the most popular spots in Uptown, mainly due to location. It hugs the corner of Broadway and Argyle, which has amazing foot traffic and two giant banks of windows. When you look inside, however, you tend to see more white faces than those of Vietnamese customers, and I can't help but think this is a sign they play to the masses (also, they have next to the most expensive bowl of pho in town, which most Vietnamese - including my co-writer, Paul Nguyen - tend to balk at). In terms of initial aroma, there isn't much. The extremely dark broth does contain very good cuts of eye of round, placed into the bowl raw, just before being covered in warm broth, but while much of the meat is juicy and pleasant, including some notable meatballs, the broth sinks it: we found it dull on both the beefy and aromatic fronts. Was there fish sauce inside? We couldn't tell. Service is friendly and fast, but for this price, there is too much competition. We debated whether to even include Le Colonial, since it's really designed more for tourists taking a break from their power shopping in and around Oak Street, looking for something a little more interesting than giant chopped salads at Barney's. But to have ignored the upscale, French-Vietnamese menu would have certainly exposed us to criticism. The bowl itself is a bit smaller than average, although it was easily a full meal for me. While it wasn't necessarily steaming, the temperature was plenty hot as I sipped the first few spoonfuls. It's got a pleasant whiff of aromatics; the top is rife with chopped scallions and white onions, dominated by three gorgeous, tender slices of tenderloin, as soft and meaty as a filet mignon at Gene & Georgetti's. There's no meatball, eye of round or brisket; certainly no tripe or tendon. 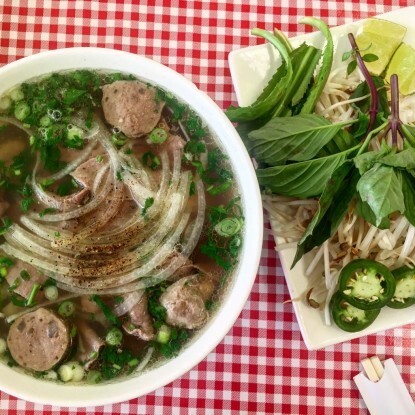 It's a gateway bowl for the masses, and yet, I stand by the ranking - ahead of Tank and 888 - since it delivers on aroma, temperature and taste. 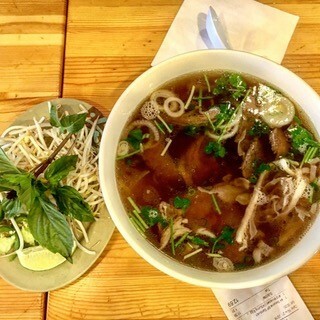 I'd leave the jalapeño out of the bowl, however, as it turned the pho into something a tad too spicy by the end. This bowl was certainly beefy, and even though it was a little light on aromatics, it was very well-balanced. Served in what looked like a ramen bowl (only one other restaurant in our survey used a bowl this shape), the temperature was closer to hot than most and it was crowned with a staggering amount of black pepper, onions and scallions. 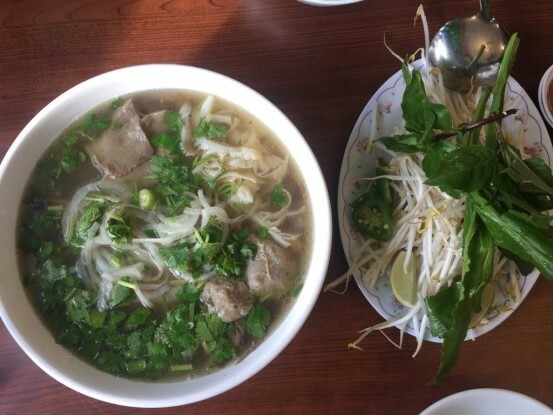 There was no tendon or tripe, and even though we thought the broth fared better than most, the beef was almost universally overcooked and the meatballs didn't do themselves any favors - they had a slightly funky taste. Funny to find this place in a strip mall in the heart of the Polish community on the city's Northwest Side. Not all that hot when presented to the table (there was actually no steam), but the aroma was certainly beefy and had a nice balance of spice/aromatics. Presentation was nice with plenty of fat droplets across surface of broth (which was tasty and well-balanced) although they go heavy on the long, white strands of onions, black pepper and scallions. Brisket and meatballs were solid but eye of round well below average; tripe was extremely tender. If you get confused thinking you've stepped into a European bar, that's because the husband (Croatian) and his wife (Vietnamese) manage to straddle both worlds. The soccer fans watch TV and drink their imported beers up at the bar, while curious customers try the Vietnamese home-cooked dishes in back. The bowl is certainly beefy, but we felt it could use more aromatics. Served in a ramen bowl, it could definitely be hotter and perhaps a bit more generous with meat for the price. Eye of round pieces were clumped together - the result of a lazy cook who didn't want to gently lay each slice over the cooked noodles, so they would cook independently when hit by broth - and there was no tendon. Top garnish of white onions, scallions and black pepper were almost generous to a fault. The broth was tasty and well-balanced, but not remarkable. Meatballs were very good, as was the tender tripe. 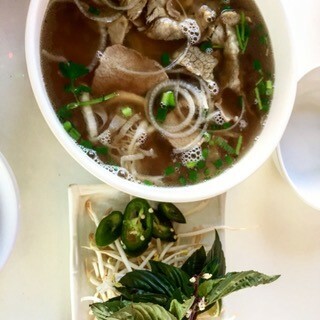 The broth here was blessedly hot, though slightly cloudy; white onions, scallion and cilantro swim around the beef, most of which is chewy but tasty. Seems like they sliced brisket against the grain to render it more tender than most. 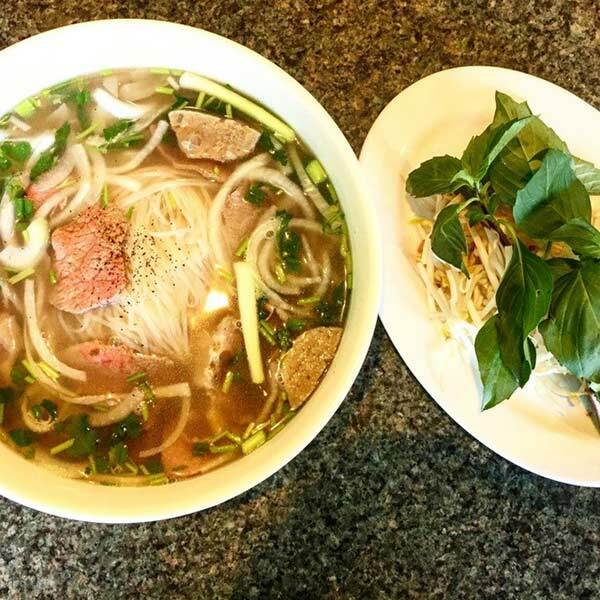 Who knew there was a pho joint in Edgebrook? When I heard Devon Ave., I immediately thought Indian food of course. But this is pretty far west from Rogers Park. It's part of a big Asian menu in a soaring space, but the broth had a nice, beefy smell and was served steaming, but still not exceptional. While lacking the aromatics we craved and hoped for, it did have a beefy-richness, bordering on fatty, that added flavor. Meats were thinly-sliced, but the eye of round was clumped-up, again, someone in kitchen not taking the time to lay out the slices so they cook independent of each other and cook evenly. The tendon was like butta - completely soft, having given up its tension in the cooking process. Two side notes: the music was not only too loud, but completely annoying, and the banh xeo (crispy crepe) was quite good. Very crisp and served with lots of herbs. Overall, a balanced aroma but nothing that blows you away. Bowl is presented well, lots of black pepper specks (maybe too much) but excellent temperature. The noodle-broth ratio was o.k. but needed a bit more meat as well as variety; thought the bowl might be a tad too tall/narrow. We think there could have been a bit more beefy flavor to broth; the meatballs were actually just average but the brisket was very good. There's definitely a more modern feel to this restaurant; we liked the updated décor. Overall, it's got a balanced aroma and the presentation is on par, although it could have been hotter. We think there could be a little more meat, because what there was turned out to be delicious: fantastic meatballs, thinly-sliced eye of round and just fatty-enough brisket. 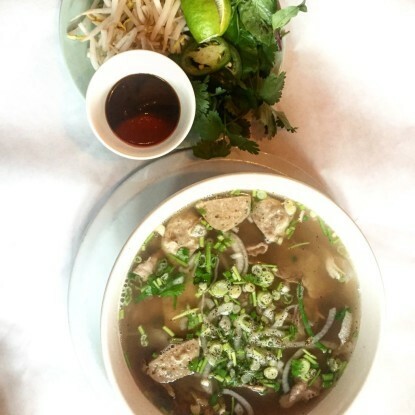 Another new, clean and modern space along Argyle, Uptown delivered a steaming bowl to the table, generously studded with scallions and cilantro. A big meatball was hacked into three pieces, and I felt, at least, that their brisket was among the best I had tasted - tender, juicy, delicious. 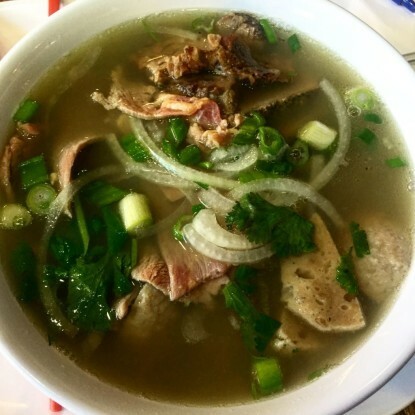 The broth is gentle - it doesn't have a hugely aromatic, intense flavor, but almost a more simple, beef soup-like quality. This is cold weather comfort. Despite the fact this bowl was missing meatballs and seemed a tad light on the scallions, it had a pleasing, balanced aroma served at a nice temperature. The eye of round could have been sliced a little thinner, but that's minor. The brisket was just a bit too fatty for us, making it harder to chew. The broth seemed just ever-so-slightly sweet with just the right note of beefiness. It's a simple broth but clearly, boiled for several hours to extract a lot of flavor from those beef bones. One issue we had: the server forgot our order, but we can't really count that against the kitchen. 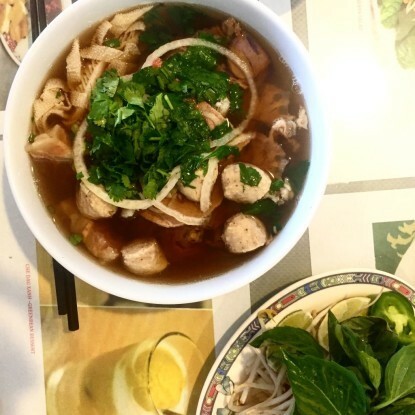 We had heard the chef from LC Pho on Lawrence had moved over to open up LD on Kedzie, so we were extra curious, since our experience at LC wasn't as great. I thought the soup was excellent. Covered with an adequate amount of onions and scallions, the beef quality is outstanding. Brisket is tender, eye of round is thinly sliced, still a rosy hue even after the broth is added and the hunks of tripe are just as soft as the forgiving noodles below. Biggest issue? You guessed it. Not hot enough. I mentioned this to the cook/server as I paid my bill, and he was surprised, saying they usually try to serve it hot. Had my bowl been really steaming, it would have likely pushed this into the top 5. I've always been a fan of Hai Yen, and this bowl didn't disappoint. As we plunged our noses over the rim, just after it was set down onto the table, we picked up a well-balanced aroma of beefiness and aromatics, and liked the amount of scallion-cilantro-white onion they garnished with. We thought there could have been a tad more meat inside, but the temperature was spot-on. Meatballs were the highlight, but thought the size/diameter/thickness of the other cuts was just right; a lot of beefy flavor in the broth to boot. It's an impressive achievement, considering the menu is so large. Like most of our top 5 picks, the dining room here is packed with Asians and there's some local art on the walls. There's a strong beefy smell at the initial whiff, not as much on the aromatics. A few shards of white onion and some chopped scallions flecked with black pepper are scattered across the top. 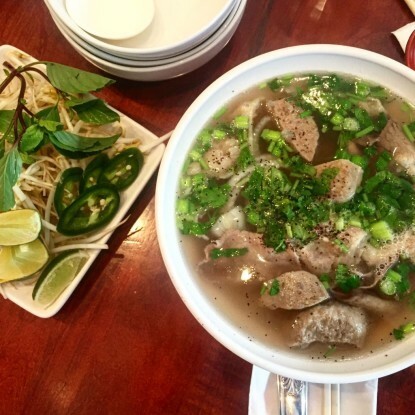 Plenty of meat here, and all of the cuts are well represented; great meatballs - tender and plump - and a very good eye of round that's thinly-sliced and yet soft, from just being barely cooked in the hot broth. 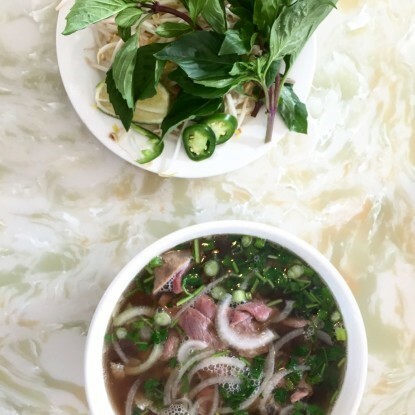 As we watched the Chinese soap opera play on the TV over the front counter, one of the city's best bowls was whisked out to our table: piping hot, adorned with plenty of scallions and white onions. This two year-old restaurant knows how to cook beef. Eye of round is thinly-sliced, very tender, right alongside a stellar brisket; there's a generous piece of oxtail as well. Broth is clear - the result of lots of straining - after a long simmer of about 16 hours. There are still plenty of fat droplets across the surface, and there are just enough aromatics emanating from the lip of the bowl as well. 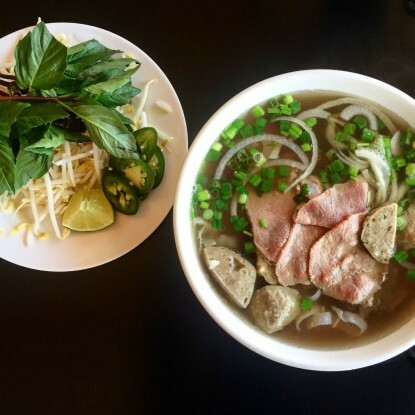 Open for seven years now, Pho Viet attracts ex-pats looking for a taste of home (or at least what their moms made growing up here). This broth - simmered gently for 14 hours - contains plenty of aromatics such as star anise, fresh ginger, black pepper and cinnamon. The aroma is well-balanced between hearty beefiness and delicate aromatics. 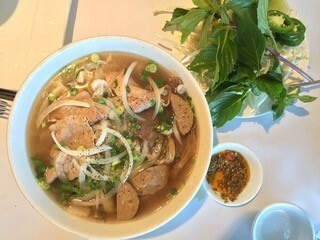 Meats are displayed proudly in the bowl, which has just a few white onions and a smattering of fresh cilantro and chopped scallion across the top. The only dud in the bowl were the mediocre meatballs, but everything else - from the tender eye of round to the fatty brisket - was memorable. 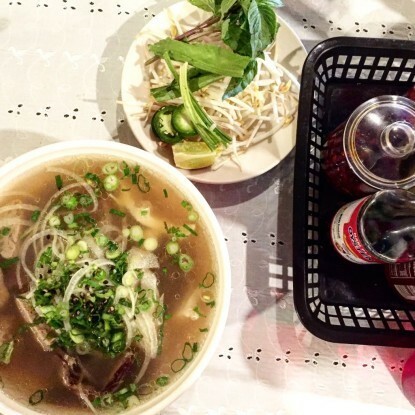 They have a large menu here, but it seems like every other table has a bowl of pho on it, for good reason. 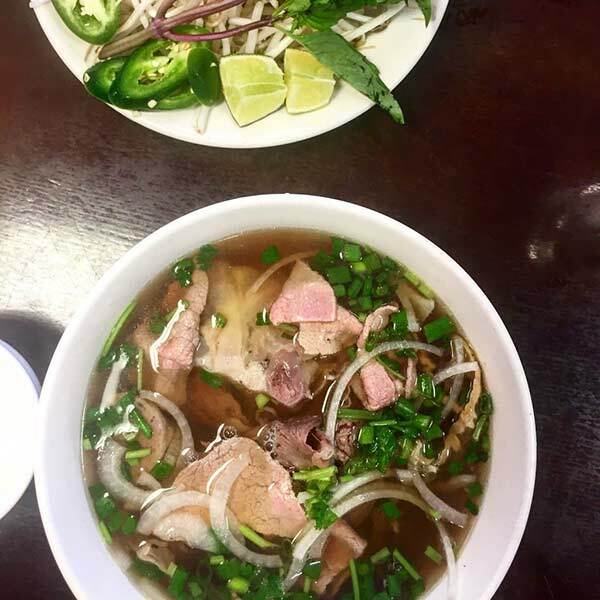 There are so many things I love about Pho Nam Lua (also known as 5 Lua): the quaint, local artwork, the friendly staff, generous condiments; the fact that it's far from Argyle and across the street from a Home Depot. This was one of those pleasant surprises you so rarely get to enjoy while checking out (and discovering) restaurants in Chicago. While they also offer a pho with Kobe (more likely Wagyu) beef, we thought that version was almost too fatty. 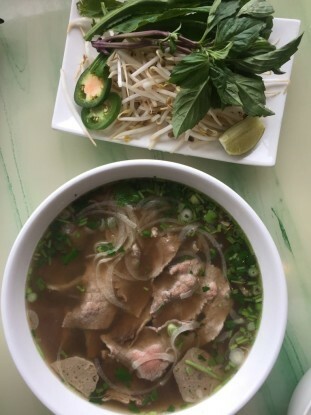 Just look at the picture above and you'll see our bowl of pho dac biet had plenty of fat droplets, even after it had been skimmed for hours. This broth had more aromatics going for it, the result of fresh leeks, lots of coriander seed, star anise and fresh ginger. 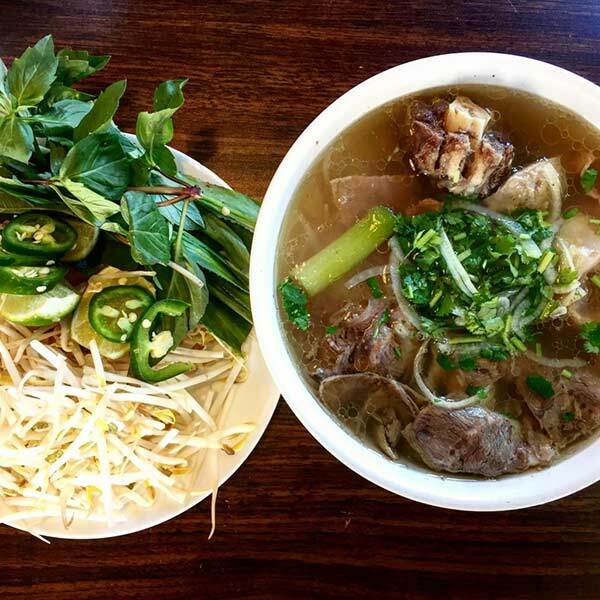 Topped with a small handful of white onions and fresh cilantro, they also manage to include some larger pieces of scallion as well as a giant hunk of oxtail. 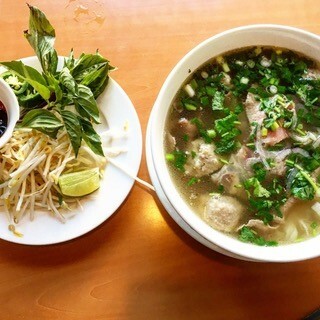 Best of all, the bowls are served at the appropriate temperature - hot - and we thought the meat quality throughout the bowl was superb - not only plump meatballs embedded with some tendon but raw eye of round just barely cooked through from the hot broth. 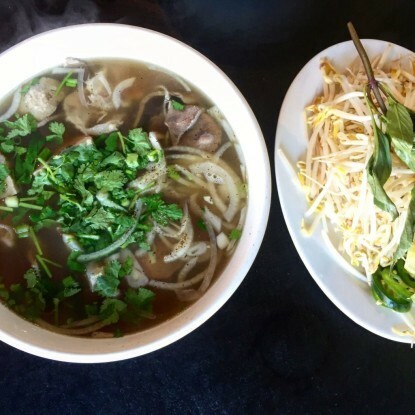 Everything is well-balanced here, from the aroma to the beefy taste and the temperature - it's a bowl I could find myself going back to all winter long. 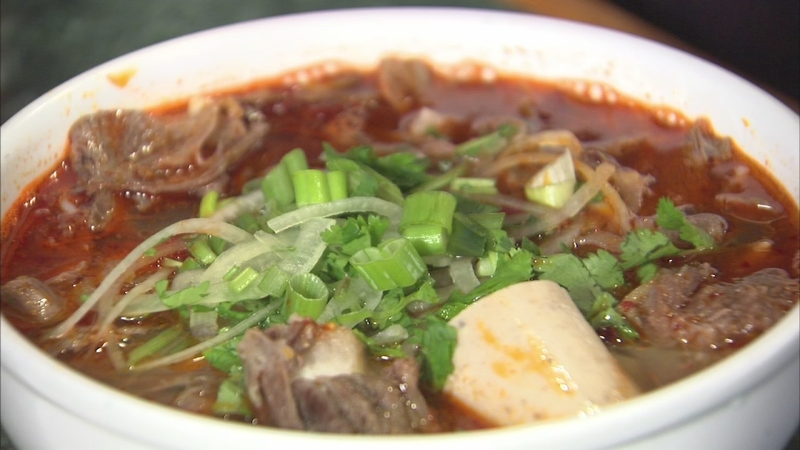 (side note: we also tried their bun bo hue - a spicy soup with drastically different noodles and condiments - and I'd recommend trying one of those as well if you haven't had it before).